The new logo design started with a printed business letterhead. Starting with a blank canvas, I created a shadow effect as one would see nearing sunset. I was going after a tropical evening feeling to enhance the main palm tree design. I recreted the palm tree logo in Photoshop adding directional relief and shadow. I dropped in a gradient background sampled from the gold tones in the main WordPress template. The final design was elegant while still emphasizing the company's Southern roots. 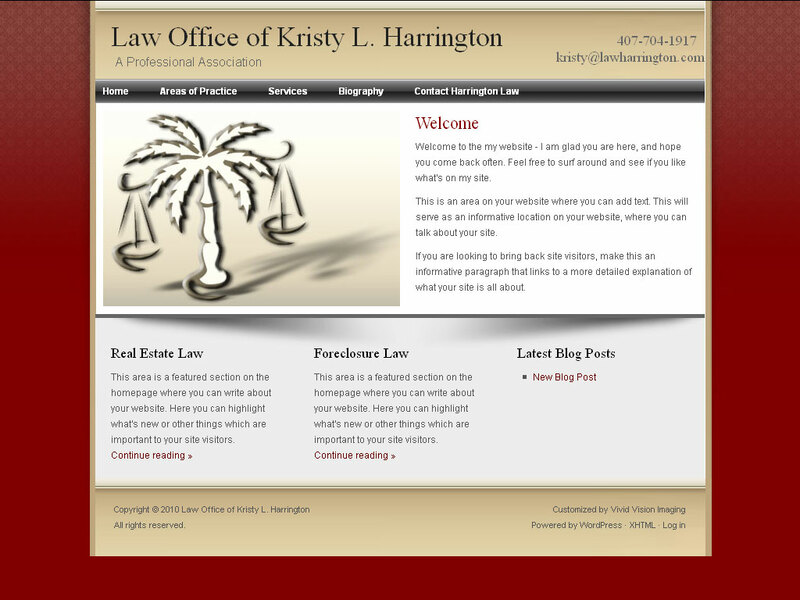 Law Harrington was one of the few clients for which I recommended WordPress. Given the expectation of less than a dozen site pages and their static content, I did not see Law Harrington needing or using the resources available in Joomla. WordPress is a fine content management system and often I recommend my Joomla clients use it on a sub or alternate domain especially for its rock solid RSS functions. However, I specialize in custom Joomla builds and hosting environments and therefore look for clients able to leverage Joomla for their business needs. Still, there are times when WordPress is the best fit and that was the case with Law Harrington. Law Harrington supplied me with a company business card (seen at left) to get the project started. During our initial consultation, Law Harrington expressed a desire for their new company logo to project their Southern roots and the relaxed hometown service they provided. However, the company also wanted a feeling of elegance challenging my design to find a balance between Southern hospitality and Park Avenue. I decided to go with an elegant theme I had in my WordPress template catalog and modify it with the client's new logo. Starting with a blank canvas in Photoshop, I recreated the palm tree logo. Next I created a shadow that gave the image a late-afternoon or evening angle. Next, I added directional relief and shadow to the palm tree. At this stage, the design was very promising, but looked too stark. To solve that, I created a gradient by sampling the gold tones in the template. Then I layered the gradient behind the palm tree to produce the image you see here. Below is a screen capture of the final design. Note: This screen capture was made before site content was added to replace the default filler text.